Did you know that adding coconut oil into your coffee can help you boost your metabolism and burn more calories? Unlike most oils, coconut oil contains medium-chain fatty acids, instead of long-chain fattyacids. Medium chain fatty acids are metabolized differently than long-chain, which leads to a beneficial boost in metabolism. In this study, 1 to 2 tablespoons of medium chain fats (eg. coconut oil) per day increased energy expenditure by 5% — this totals to 120 calories per day. Coconut Oil Coffee Creamer Has Great Taste! It does not make your coffee greasy or coconut-y as one might think. Instead, this coconut oil coffee creamer provides you with a rich and creamy coffee that is perfectly sweetened with honey, and flavored with cinnamon and vanilla. No palm-oil, no preservatives, and no artificial sweeteners. .Unlike adding cold milk or cream, coconut oil creamer doesn't cool down your hot cup of coffee. .Coconut oil creamer doesn't dilute the flavor. .Coconut oil is always on-hand, whereas diary creamers expire. How To Make Coconut Oil Coffee Creamer. If you don't like your coffee sweet, then leave out the honey or start using less. Combine all of the ingredients in a bowl and stir or whisk together until they're well combined. Store in a glass jar with a sealed lid. Brew your favorite cup of coffee (about 2 cups). Add 1-2 tbsp. of coconut oil coffee creamer into your hot coffee. If you want to enhance the creaminess and flavor, you can also add a teaspoon of grass-fed butter. 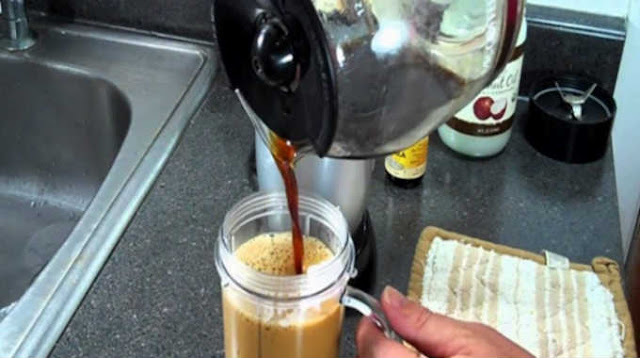 Using a blender or mini bullet blender, blend the coffee and creamer on high speed for about 5 seconds. Pour into your mug, pair this coffee with a nutritious breakfast, and you've set yourself up for a great day!